WordPress page builders have become wildly popular because they let anyone, even those without the gift of code, build a beautiful website or landing page. But have you ever wondered what’s going on underneath the hood? Are the finished products that page builders put out all the same when it comes to performance? It’s an important question to answer because how quickly your website loads is tied to its success. But unless you want to take the time to build identical landing pages with different page builders and test their performance, it’s hard to know for sure how each page builder stacks up. I built near-identical landing pages with five popular WordPress page builders and then ran them through a bevy of performance tests. Now, I’m going to share all of that data with you. To test each page builder’s performance, I’m going to build a landing page using each of the five page builders. I’ll base this roughly on the Pagely landing page, with a few elements added and removed. These landing pages will be, as much as possible, perfectly identical, though this isn’t always achievable because of the elements available in each page builder. 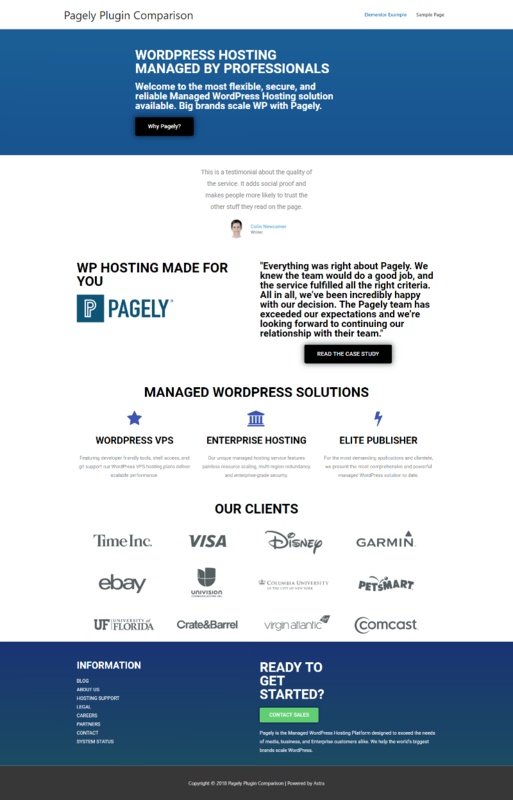 Also, don’t expect them to look as good as the original Pagely homepage because I’m…well, not a professional designer (or even an amateur designer). I’ll also time how long it takes me to build the demo landing page, but I recommend that you take these numbers as rough estimates, rather than absolutes. Going into these tests, I’ve used some of these page builders more than the others, so it’s not scientific for me to declare one “easier to use” than the others. For these tests to hold any value, they need to be consistent. And you need to trust that they’re consistent. *Because Elementor Pro is an add-on, rather than a standalone plugin like the other premium versions, I think it’s fair to test using the free version of Elementor. Now that you know what these tests are built on, let’s jump in and look at the data! Then, at the end, I’ll put it all together in one, easy-to-compare table and make some conclusions! If you’d rather skip the play-by-play, you can click here to skip straight to the summary table. What The Landing Page Looked Like: *SiteOrigin Page Builder doesn’t have a counter element, so I used static HTML instead which gives it a slight advantage in the performance tests. After all the tests were run and the data crunched, here’s how things shook out. What Conclusions Can We Draw About Page Builder Performance? Unsurprisingly SiteOrigin Page Builder had the best performance in nearly all of the tests. SiteOrigin Page Builder isn’t just lightweight when it comes to performance – it’s also lightweight when it comes to features. You get better performance than the other page builders by, in part, sacrificing functionality. For the performance-focused, that trade-off might be well worth it. But other people might be willing to trade a bit of performance for a more powerful page building experience, and I don’t think there’s necessarily anything wrong with that. The average user will be able to build a more complex page with one of the other four page builders. For that reason, I think it’s best to look for a page builder that has the features you need and then compare the performance of page builders that meet that criteria. If you exclude SiteOrigin Page Builder and just focus on the more feature-rich page builders, you’ll notice that there isn’t a ton of difference between them. You can certainly spot some differences – Elementor is a bit heavy on database queries and requests, while Beaver Builder offered the smallest page size. But overall, all of these plugins have clearly worked to optimize performance, which is probably why they’re the market leaders in the space. If you’re choosing a page builder for life, you don’t need to worry about this. But if you think there’s a chance you might switch (or stop using) page builders down the road, it’s important to point out that only two of these page builders leave behind completely clean code. SiteOrigin Page Builder leaves behind mostly clean code, but it does leave a few shortcodes, notably showing up wherever I used buttons. Finally, both Divi Builder and WPBakery Page Builder leave behind a heap of shortcodes that you’ll need to find a way to remove. What Are Your Experiences With WordPress Page Builders Performance? You saw our data. Now, what about you? What are your own experiences with page builders and performance? And more importantly, where do you think the balance should lie between features and performance? For another in depth opinion piece from Pippin Williamson on page builder plugins, check this out. I have used all this page builders and I don’t like them : too little possibilities or bloated code. I I personnaly use Oxygenapp since few month and I like it. Unfortunately it seems that very few people know it. This page builder don’t use a theme, all the design is stored in the database. I don’t know if it’s good for page speed but after deactivating the plugin, the design still exactly the same. I love the way I can add or edit code or CSS, this is the most powerfull page builder I have used. I would love to see a technical test of it. Hello i was actually reasearching to see what happens if you deactivate oxygen, so the design and the content of the page will stay intact if i deactivate oxygen? Great article/comparison of tools. Wish Thrive Architect was included in this review. Thanks! 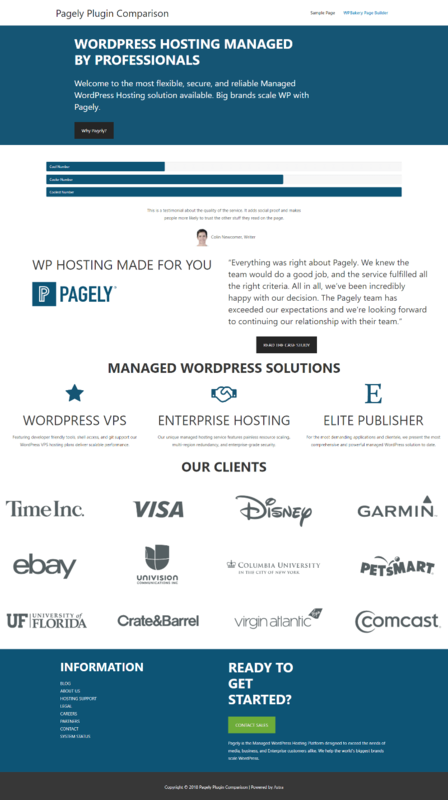 Very unexpected but awesome review of WP Page Builders. I’m a BeaverBuilder Fan but I have to say the competition is heating up. Best test about page builder I have ever seen. Thank you for this awesome post. First of all great article! 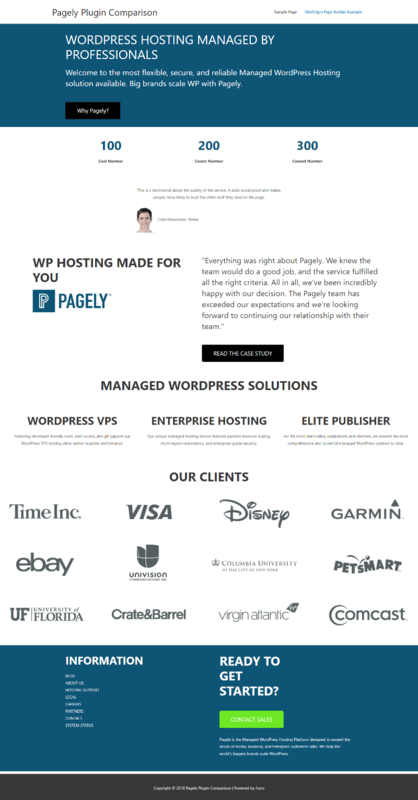 I have been using WP Page Builder and my WordPress Admin is super slow. I’m using a shared hosting account which is not helping the situation. I used to build websites using PHP HTML includes only. Then I got lazy and switched to WordPress. It has made some things easier but overall I just get sick of building pages with WP Page Builder as its slow and takes forever to update a page. I’ve been looking for a comparison like this. Thanks Colin. Very valuable info. Great job! This is exactly what I was looking for. It is a difficult balance choosing a good theme with page builder and enough options to make a site unique yet load quickly. WP Bakery does seems to take a long time to develop and front-end editing is not accurate. Thank you! We have a multi-site license for Elementor and absolutely love it. We use it on almost every website we build now. Sits over the top of Genesis Framework a treat and it so much fast to build than WP Bakery. yaser kheradmand 3 days, 8 hours ago. WordPress Webinar Plugin Review: Google Hangouts FTW!